Isn’t the basic point of going to college is to graduate? I don’t know why, but whenever I bring up comparing graduation rates when considering colleges, I get a fairly hostile reaction–at least in online forums. It’s almost as if I suggested using a school’s football rankings as a way to pick the school. So what is wrong with looking at college graduation rates? The most common response is that the college graduation rates are simply a reflection of the quality of the students and have nothing to do with the college. Therefore, I’m not being fair to the school if I focus on graduation rates. I get the feeling that these critics are thinking I’m comparing the Harvard graduation rate with the graduation rate of the state university’s local campus. No, I’m interested in comparing apples to apples so I would compare the local campus of State U to another campus in another city and Harvard to other Ivy League Schools. Just as a FYI, according to the Integrated Postsecondary Education Data System (IPEDS) Harvard’s four-year graduation rate was 86%, Princeton’s 90%, Yale 87%, and Stanford 76% (and yes, I know Stanford isn’t part of the Ivy League). Reciting these statistics would inevitably lead to the second most common argument against comparing college graduation rates, some schools have a higher percentage of students in a degree that often takes more than four years to complete, such as engineering. Okay, so then compare it to other schools with a similar percentage of engineering grads. Engineering degrees represented 19% of Stanford’s undergraduate degrees compared to 4% of Harvard’s and 26% of Princeton’s. Princeton’s graduation rate is higher than Stanford’s even with more engineering graduates. 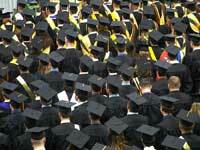 Graduation rates are becoming more prominent in college rankings. Both the Washington Monthly College Rankings and US News College Rankings include a predicted graduation rate based on factors such as the number of students with Pell Grants. According to US News, Harvard “overperformed” its expected graduation rate by one percentage points but Stanford underperformed by one percentage point. Essentially, US News is saying that schools are doing equally well given their student characteristics. The fact is that the Stanford freshman class had lower test scores and a higher percentage of Hispanic students when compared to Harvard. So are we comparing apples to apples yet? Look, I know there are all kinds of problems in calculating and comparing college graduation rates. Since transfer rates are difficult to include, if they are included at all, community colleges are especially vulnerable to unfair evaluations based on their graduation rates. Then there is the issue of how well prepared the students are who enter the school. It’s not really fair to compare a community college that pretty much takes any student no matter how many remediation classes he has to take with a college that has minimum testing score requirements. But knowing these limitations, why wouldn’t you use this information in making your decision? I’m not saying graduation rates should be the only consideration in selecting a college. For many students, there is no such thing as choosing a college, they go where they can afford to or what is immediately available in their area. Of course, you shouldn’t compare a local commuter school with a nationally ranked Liberal Arts College. But if you are considering more than one college with some hefty price tags, wouldn’t you want to know what the odds are of graduating in four years? To give you a better idea of what I’m talking about, let’s pick on my home state of Texas for a while. According to the IPEDS data in the DIY College Rankings Spreadsheet, there were a total of 15 schools with an estimated median SAT between 1000 and 1099. The eight private schools had four-year graduation rates that vary from 19% to 45%. The six public universities reporting graduation rates, varied between 11% and 29%. Should you pay private tuition at a school that has a 19% graduation rate when you could probably get into the state school that has a 29% graduation rate? 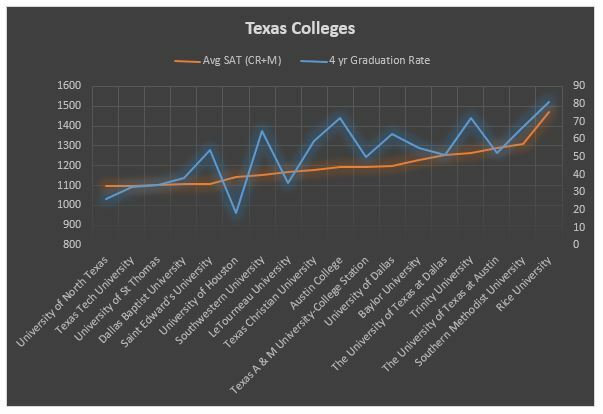 The following chart shows the graduation rate for 18 colleges and universities in Texas with an average estimated SAT score of 1100 or higher. Five schools with an average SAT score between 1100 and 1110 had graduation rates ranging from 26% to 54%. Given the cost of higher education, don’t you think you should know why the differences exist? These differences are more pronounced when you look at institutions across the nation. According to IPEDS, there are 26 colleges with at least 500 undergraduates and an estimated average SAT score between 1300 and 1350. The four-year graduation rate for these schools vary from 40% to 91%. I think it’s reasonable to compare public school schools five-year graduation rates with private schools four-year graduation rates since the cost of public schools is significantly lower and can justify an extra year to finish a degree. This group of colleges also includes a perfect example of the potential role of engineering on graduation rates. The Stevens Institute of Technology awards 62% of its degrees in engineering. Its four-year graduation rate is 40% but its five-year graduation rate is 78%. But then there’s the Rose-Hulman Institute of Technology that awards 80% of its degrees in Engineering and has a four-year graduation rate of 57% and a five-year rate of 71%. Does the difference in graduation rates between the two schools automatically make Rose-Hulman the preferred school if you want to graduate in four years? Not at all. There are enough differences between the schools in the areas of average net price, endowment per student, percentage of freshman receiving Pell Grants, and the student’s racial/ethnic composition to require anyone interested in the schools to look more closely at both schools. Looking at this information is a way of identifying trade-offs. You’re willing to attend a school with a lower graduation rate because it offers the program you’re interested in or they’re providing you with a scholarship. There are lots of good reasons to attend schools with lower graduation rates. What constitutes good will vary from person to person so while the difference in graduation rates might be justifiable to one person, there may not be any mitigating circumstances for another. Stevens Tech engineering is a 5 year co-op based program. That’s why students in that program do not graduate in four years. Thanks for sharing, that’s exactly the kind of information people should be looking for to explain the differences in graduation rates.